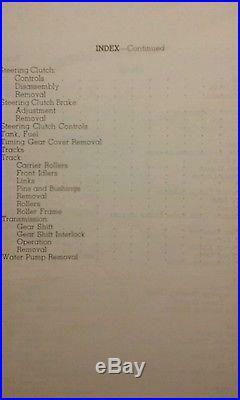 This is a reimaged printing of a: complete Servicemen's Reference Book (Service Repair Dealership Master Major Overhaul Technical Mechanic Shop Teardown Rebuilding Procedures Manual) for Caterpillar Crawler CAT Dozer Diesel D4 Tractor s/n: 4G, 7J, 2T, 5T, 6U, & 7U series. 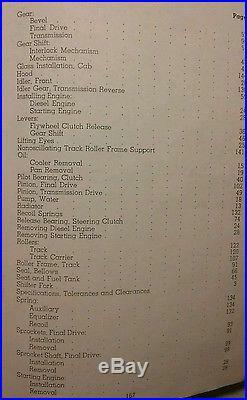 Full size 8.5" X 11" manual, covering: Specifications, Dimensions, Crankshaft, Camshaft, Timing, Valves, Pistons, Rings, Connecting Rods, Heads, Gaskets, Bearings, Seals, Tolerances, Torque Specs, Inspection, Injector Pumps, Injectors, Steering System, Wiring Diagram Schematic Circuits, Diesel Engine, Gasoline Starting Motor, Assembly Disassembly Teardown Rebuilding Procedures, Carburetor, Air Cleaner, Magneto Lubricating System Transmission, Final Drive, Sprocket, Rollers, Brake System Clutch System, Adjustments, Governor, Linkages, Controls, Fuel System, Cooling system, Tracks, Rails, etc..... NOTE: Due to condition of original documents, what is left of their frailty, there might be flaws, pen marks, hard to read, spots, worn, torn, and or blemishes and I apologize ahead of time! PLEASE LOOK at the photos and see if this will work for your model. 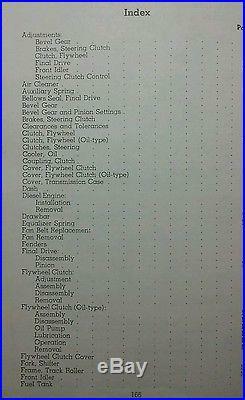 This manual has all the information you need to help you restore, find the right parts, or simply get up and running. Proper service and maintenance will greatly increase the life span of your equipment. Knowledge is the most valuable tool, So Don't Work Harder, Work Smarter With This Book! This reimaged book is made from the original using digital enhancing tools making a better quality book delivering super clarity on heavy cardstock for book covers and high grade bright paper. Our books are built to high standards of quality and durability! Painstaking efforts of digital document restoration consists of: Analyzing one page at a time to bring out the absolute BEST image, turning out BETTER than the original! Printing in full color when possible to present the full aspect of the original author. Heavy plastic top and bottom to protect against all elements. The plasticoil binder allows any page to be fully open, (Wrenching while reading) for ease of use and keeps hands off the frail originals. 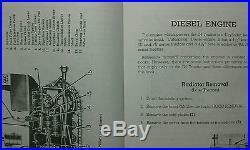 See our store for more books and parts. OUR MISSION IS: To give you the best manual that will serve it's purpose of clarity, utility and longevity! Preserving History One Page At a Time! Sharing my collection with my fellow Gearheads! Thank You All For your Positive Support Through the Years. Bulldozer Construction Agricultural Logging Forest Thinning Winter Prep Preppers Off-Grid Forestry Landscaping Power Outdoor Equipment Greens Keeping Groundskeeper Golf Course Parks Recreation Industrial Professional Farm Field Land Development Highway Industrial Improvement Clearing D2 D4 D6 RD6 RD4 977 Traxcavator D7 D8. 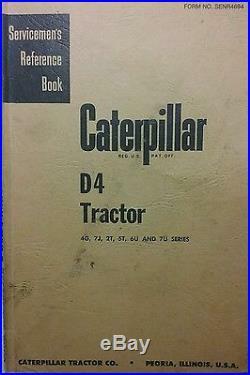 The item "Caterpillar Diesel D4 Tractor Service Manual 172p 4G 7J 2T 5T 6U 7U Crawler CAT" is in sale since Monday, August 27, 2018. This item is in the category "Business & Industrial\Heavy Equipment, Parts & Attachments\Heavy Equipment Parts & Accessories\Heavy Equipment Manuals & Books". The seller is "looie20" and is located in Chewelah, Washington. This item can be shipped worldwide.